Last week on the blog we revealed the seventh of our updated Season 4 model cards, the Mortician’s Guild Spirit Weaver, Scalpel. Today our reveals will be taking a bit of a change of pace, as we discuss some of our changes to the Ratcatcher’s Guild in general. As we mentioned in our last blog, one of the first things we did when we started the development of Season 4 was to take a look at the intended playstyle for every Guild as a whole, and then each model individually. This process helped us to identify not only which models needed to change, but also by how much and with what purpose in mind. These objectives were in addition to overall aims such as reducing complexity and tweaking game balance. With the Ratcatcher’s Guild, there have been a few factors swirling around them that has made the Guild quite controversial since its release. Primarily, and perhaps the one that has been the most frustrating, is that the Ratcatchers were always intended to be a team capable of inflicting take outs, but not reliant on them as a game plan. Unfortunately, this has not been the case. What we’ve seen since the team’s release is quite a lot of Ratcatcher coaches gravitating towards taking out enemy models while benefiting from both Grave Digger from Veteran Graves and Snackbreak from Scourge. Together, these abilities give the Ratcatchers access to take outs that are worth 4 VP instead of 2. The original intention for these ‘Snack-Digger’ take outs was that they would serve as a decent alternative or back up plan should the goal scoring game go slightly awry. What’s actually been happening is that the majority of Ratcatcher coaches are finding Snack-Digger take outs easier to engineer than scoring goals, so they are defaulting to using these 4VP take outs as the primary game plan. Ultimately, we decided that we needed to make a few small adjustments to the Ratcatchers in order to adjust their playstyle back to what it was always intended to be. Additionally, we took a few steps to give the Ratcatchers a small boost in power level at the same time. Using Piper as our example, we can illustrate some of the tweaks we’ve made just to refocus the Ratcatcher’s Guild. First and foremost, we increased Piper’s KICK stat from 3/6 to 4/6. One of the key parts of Piper’s game plan is to score goals through the use of Reverie or by himself if presented with the opportunity. To this extent, Piper will benefit immensely from the S4 change to the kicking rules which allows models to make a successful kick if they roll a 3+ on the TN test rather than a 4+ at half range or less, but it also felt fitting to grant him an extra kick die just to make his kicks that much more accurate. Considering that Piper will often need to pass the ball to a friendly model before using Reverie, this change should come into play at a lot of important moments in Ratcatcher games. Another small tweak we made to Piper was to reduce the cost of his first character play, Pay the Piper, from 2 influence down to 1. As the Ratcatchers are an offshoot of the Mortician’s Guild, they still get to play with a reasonably strong ‘control’ element to their playstyle. And as we discussed in the Scalpel blog last week, our definition of a control playstyle is one of increasing options for the friendly team whilst reducing options for the enemy team. With Pay the Piper in play more often due to its reduced cost, the enemy team will have to carefully consider whether they really need to spend their momentum on counter attacks or removing conditions and so on, since each time they do so while close to Piper will cause the Ratcatchers to gain extra momentum! For those wondering, there are no other changes to Piper. 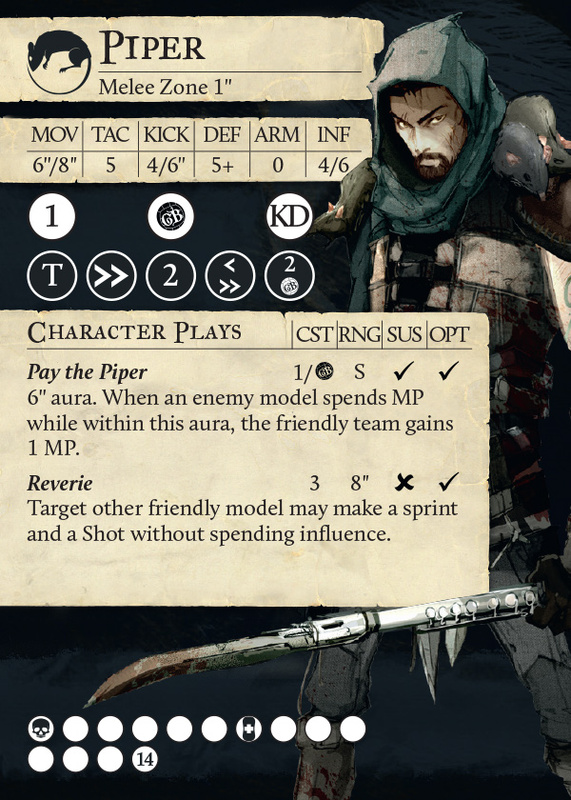 Skulk is another great example of some small changes to the Ratcatchers that will help to refocus their game plan and slightly improve their overall strength. Like Piper, Skulk also gained an extra kick die, going from a 2/6 KICK stat to 3/6. The second change to Skulk was to his playbook, where we moved his knockdown result down from the sixth column to the fourth. This doesn’t make Skulk’s knockdown result consistent by any means. However, having Skulk’s knockdown result on the fourth column means that it could be accessed when Skulk is attacking an enemy model with low DEF, or when Skulk is benefitting from a few Ganging Up bonuses. It also means that Skulk’s Parting Blows have a much higher chance of knocking down enemy models, and is just generally quite handy. The only other change on Skulk was to remove the character trait Goal Rats since it was rarely used and added complexity to the model. So, this change isn’t directly related to the Ratcatchers ability to score goals, but it is central to one of the core design aspects of the guild, the disease condition. The intention of the disease condition was always that the Ratcatchers AND their enemies would suffer from it, but the Ratcatchers would have a few inbuilt methods of combatting it better than their opponents. Part of this is actually reflected in our change to Pay the Piper, if you follow the theory that Pay the Piper will be in effect more often, then it is also likely that the Ratcatchers will have a little more momentum to spend on things like recovering health and removing conditions. The second part of our tweak to how the Ratcatchers deal with the disease condition is through Miasma’s character trait, Salve. In Season 3 Salve gave Miasma a single free use of Come on Mate to remove conditions. Unfortunately, this didn’t quite give the Ratcatchers enough tools to combat certain teams, such as the Alchemists or any enemy team with decent access to knockdown. The Season 4 version of Salve actually benefits the Ratcatchers suffering the disease condition while they’re close to Miasma. Let’s take quite a common example of Scourge suffering the knocked down and disease conditions while close to Miasma. In Season 3, Miasma would have to activate in order to remove the knocked down condition from Scourge, but in doing so she would also remove the disease condition, which she could then spread back to Scourge just by standing close to him, but this adds further tactical complications. In Season 4, Scourge can just activate and remove the knocked down condition from himself due to Salve whilst retaining the disease condition so that he can still attack enemies with increased damage due to Plague Ridden. Updated Salve is the only change to Miasma. The additional healing is super helpful for Scourge, really helping push his tankiness even further, but yes, we know that losing the extra VP gain is painful, and we understand that. However, we really have pushed the goal scoring aspects of the Ratcatchers. Their win condition has now swung heavily towards getting 3 goals, or 2 goals and a couple of opportunistic takeouts, as was originally intended. From a design standpoint, we’re really happy with where this decision has ended up. The Ratcatchers occupy a special place in our hearts as the first ever Minor Guild, and we’ve steered their playstyle back to our original intent carefully. The changes to Veteran Graves and Bonesaw are key to this playstyle change, so to set your minds at ease a little, let’s have a look at something from each of those model’s cards. Veteran Graves has this brand new character play, Exhaustion. This is a super cool rule, which really pushes another aspect of the Ratcatchers, that of draining their opponent’s momentum. The dream scenario is an opposing model declaring a Counter Attack within the auras of both Pay the Piper and Exhaustion. This Counter Attack would cost the enemy team 2 Momentum AND give the Ratcatchers 1, a three momentum swing in your favour! Veteran Graves also has a sweet Guild Ball/KD result on column 2, allowing him to knock enemy models down and trigger this character play at the same time. This play is an extremely useful tool that buffs an already strong aspect of the Ratcatcher’s playstyle. In addition, Graves picked up Close Control to help the Ratcatchers keep control of the ball. That’s all for today folks. We hope you enjoyed today’s reveal of our changes to the Ratcatcher’s Guild. Join us next time to see the reveal of the Season 4 player card for the Hunter’s Guild captain Skatha, the Champion of the Moon Goddess.